I have a few people ask about doing a Revision Cloud in the Inventor Drawing environment. There is no tool by default with Inventor, but there are few ‘bonus’ tools which are available in the SDK. I don’t think these are officially supported as they are development tools, but many people use them. The User Tools help automate certain tasks for Inventor users that are not available in the Inventor product itself. There are also Developer Tools which include samples and tools intended to help developers write applications using the Inventor API. - Check Spelling - Check spelling command provides to do spell check for text in text boxes, drawing dimensions and drawing notes. - Chain Dimension - create chain dimensions for drawing sketch and drawing view entities. - Alpha Sort Sheets - Sorts the names of the sheets in the Inventor browser in alphabetical order. - Revision Cloud - Create a revision cloud. Make sure you have administrator permissions to do this. You may need to temporarily disable the anti-virus and User Account Control (UAC) also. 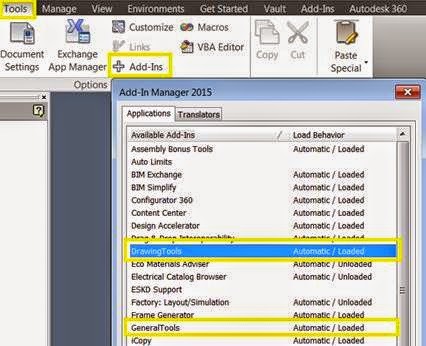 Search for UserTools.msi (should be in C:\Users\Public\Documents\Autodesk\Inventor 2015\SDK folder). Make sure you have Inventor closed. Launch Inventor when finished & start a drawing. In the Add-Ins tab - there should now be a General Tools and Drawing Tools Panels. If not, check that (under Tools > Add-Ins) General Tools and Drawing Tools Add-ins are available and loaded. You might need to restart your computer. Your tools should now be working.